The main memorial complex in Vukovar about the Croatian War of Independence in general and the Battle of Vukovar in particular. It consists primarily of a large selection of open-air displays of tanks and other armoured vehicles, missile launchers, artillery, planes, fortifications and such like, but also has two indoor exhibitions. More background info: in general and about the Homeland War see under Croatia and Vukovar. The official full name of the institution is Memorial Centre of Homeland War Vukovar (abbreviated MCHW), or in the original Croatian: Memorijalni Centar Domovinskog Rata Vukovar (MCDR). It's a public institution devoted to the preservation of memories of the war and to collecting documents and other records pertaining to it. It also has an educational aim and hosts extensive school programmes, but also sees itself as promoting tourism in the region. Under its umbrella also fall some of the other memorial sites in and around Vukovar, such as the Memorial Home of Croatian Defenders and the Ovčara Memorial. What there is to see: Once you've passed through security and walked along the road toward the big exhibits also take a look to the right to spot the still bullet-hole-riddled eastern wall of the former synagogue (see below). You then come to the centre of the complex where various large objects are on open-air display. The exact locations of these seems to vary, and in fact as I was there (in March 2018) they were shifting some of the armoured vehicles to different positions. 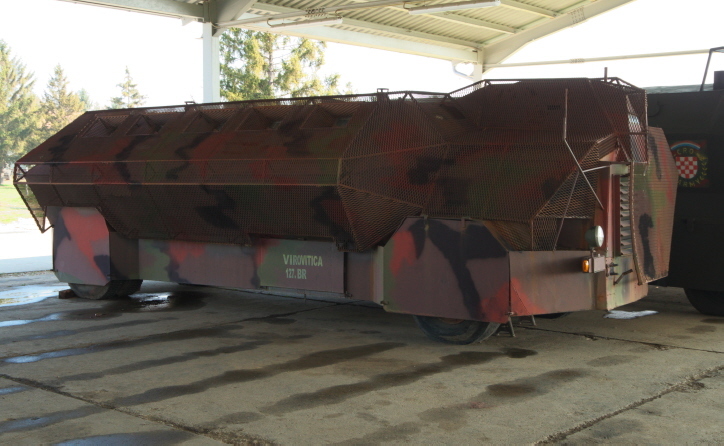 At the time of my visit, the first large item I passed was an amphibious landing craft, presumably of the sort used by the Yugoslav/Serbian Army to cross the Danube to get to Vukovar. Also nearby was a colourful Antonov An-2 biplane (an old Soviet design still in use and praised for its extreme STOL capabilities) and a MiG-21 fighter jet. Otherwise it was mostly tanks of various types. But to the left of the main path was an interesting area, less in your face than all those tanks, but more remarkable in my eyes: a simulated minefield with mine-sweeping “soldiers”. These figures consisted just of roughly man-shaped wire structures with helmets on their “heads”. They are actually a theme in the rest of the exhibitions too. Various different types of mines are labelled, but only in Croatian (though some of the names are self-explanatory enough). To the west of the minefield are yet more open-air displays of tanks and a row of artillery, from small-calibre towed guns to big heavy howitzers. In addition, two types of modern missile launchers look like they're ready to fire. Some of the vehicles on display are only partially open-air, namely protected by a roof of a shed-like structure which, however, doesn't have a roof. Here some rather bizarre and improvised-looking armoured personnel carriers were on display. In the vast field beyond is what a sign with a map describes as “simulation of a battlefield – reinforced brigade in defense”. This includes various dugouts, gun positions partially protected by earth mounds, ammunition bunkers, trenches, radar and ambulance vehicles at the rear, and yet more tanks, some of them burnt-out wrecks. A tail piece of a wreck of a shot-down Yugoslav Air Force MiG also sits in the middle of the field. The battlefield and positions are populated by yet more “wire soldiers” wielding machine guns or anti-tank rocket-propelled grenade launchers and ones loading the howitzers with shells. The wire sculptures add a strange element of surrealism to the whole thing. In a way that's better, I think, than having proper, realistic-looking mannequins instead. After exploring the large outdoor area, you finally get to the two indoor museum exhibitions. They're housed in two buildings in the eastern part of the complex. 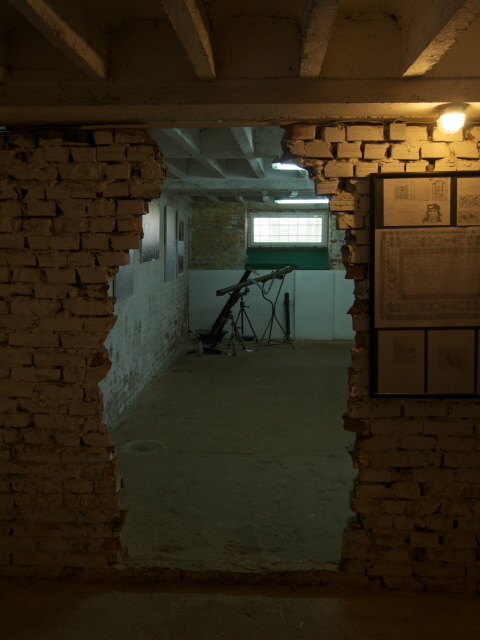 The first one is about two Serbian concentration camps set up during the war, and is housed in the basement of the building on the left, while the general exhibition is located on the ground floor of the building on the right, which is clad in a strange camouflage-colour layer. 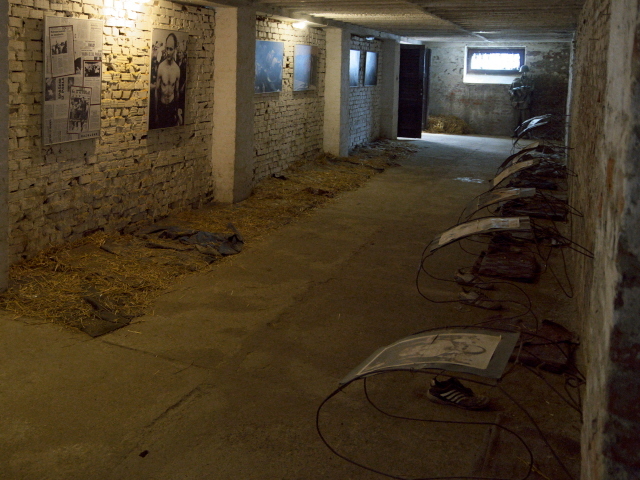 The concentration camps section picks up on the “wire soldiers” thread of the outdoor part, with a row of wire structures representing men bending over on their knees on little pieces of cloth on a straw-covered floor, with a few shoes scattered in between. Each one comes with some text-and/or photo panel or newspaper clippings. The texts are all in Croatian only, but the images are pretty self-explanatory. There are more photos on the opposite wall showing scenes from such camps. 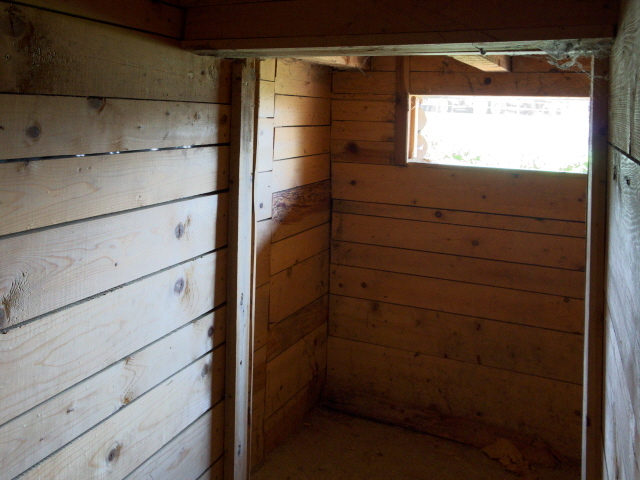 In a room to the side of the concentration-camp section, reached through a hole in the wall that looks like it's been torn by a bomb blast, contains more artefacts than texts, though here at least there is some English translation. On display are mostly home-made weapons from 1990 and 1991. There's also a part where you walk over a metal grille underneath of which various landmines are on display. That's a somewhat disturbing feeling, thus almost treading on such mines. 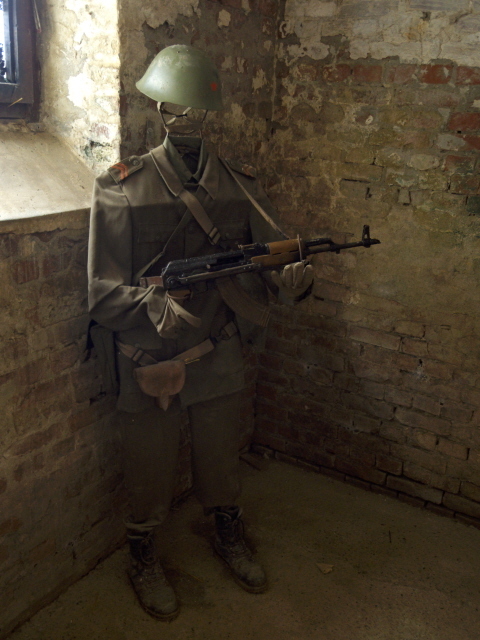 The other exhibition chronicles the Battle of Vukovar and the Homeland War from a more general perspective. Texts here are mostly in Croatian only, too, though there are also a few German- and English-language newspaper clippings. So if you don't know any Croatian you only get a patchy picture, but several displays speak for themselves enough for you to get an idea. 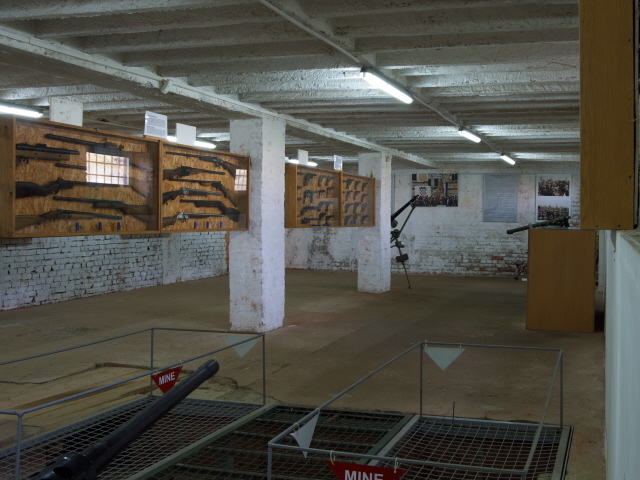 This includes sketches drawn by victims of the conditions in those Serbian concentration camps, personal effects, medical aid supplies, yet more “wire soldiers” brandishing weapons, and yet more displays of home-made weapons, including Molotov cocktails fashioned from drinks cans. A couple of maps illustrate the locations of battle sites and shifting front lines. Of course there are also plenty of photos showing the level of destruction in Vukovar resulting from the battle. If you've already had a good walk around town, you will recognize many places and buildings, while on other pictures the destruction is such that nothing is recognizable any more. Yet another section is about the Dayton Accords that more or less ended the war in Bosnia & Herzegovina and Croatia, as well as about the war-crimes tribunals after the war. All in all, this is more a place for those who enjoy being up and close to all manner of military hardware, for which the outdoor part provided plenty of opportunities. Those seeking more balanced background information may be disappointed. The two indoor exhibitions do provide some information, but to get a bigger picture you have to be able to read Croatian, otherwise you won't learn much here. As in the Vukovar Hospital exhibition or at Ovčara, it's all much more visual than informational. Location: south of the centre of Vukovar, eastern Croatia, along the No. 57 trunk road leading out of town to the south. Access and costs: restricted (ID required), but free. Details: Best reached by car or bike, but it's also just within walking distance, ca. one mile (1.7 km) from the centre of Vukovar, heading south from the main through road of the eastern half of Vukovar along Ul Europske unije, which later becomes Sajmište ul. For cars there are a few spaces near the public entrance, but not that many (you can find somewhere to park in the vicinity though). This entrance is not on the main road but on Ul. Ive Tijardovića, which branches off the main road towards the east on the northern perimeter of the large complex. There's a security gate and at the window you have to produce your passport or other official ID document to the guard on duty there to sign you in – that's because parts of the complex are actually still part of a military garrison. Opening times: weekdays only, between 8 a.m. and 4 p.m.; on weekends only open for groups by prior appointment. Time required: the area is vast so to cover the grounds alone you'll need about an hour or so, more if you linger by the various open-air displays for closer inspection. The indoor exhibitions can take between a mere half an hour or more than two hours, provided you can read Croatian. Right next door to the security gate and entrance to the complex are the ruins of a synagogue that are worth a look too (see also under Vukovar). Combinations with non-dark destinations: nothing in the immediate environs – but see under Vukovar in general.